Being a lover of extreme weather, one could not complain at the encounters with the wild side of nature that have dominated this traditionally boring time of the year! From a great snow outbreak in Northern NSW, to the major flooding in NE NSW and SE QLD, this winter hasn’t been a quiet one! But to my disbelief, July 13th would provide another dose of exciting weather that would carry me through the last few months before the next storm season arrives! An accidental click on the Grafton radar link when meaning to click on Google on my links page set the event in motion. 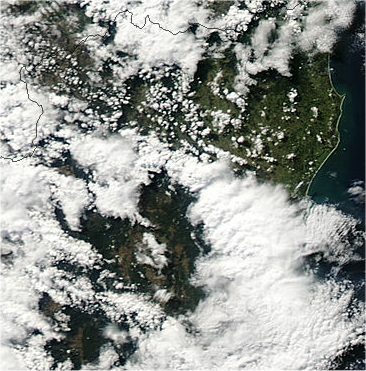 I was very surprised to see what looked like a weak line of storms along the Richmond Range progressing towards the coast around lunchtime. While the echoes were only in the light to moderate range, the fact they were there at all seemed a miracle to me! Next stop was a check of lightning tracker to see if they were just showers as suggested by the Northern Rivers forecast. Sure enough, there were several strikes in the area of the echoes. I had to finish doing a few things in Alstonville, but raced home when a quick check of radar showed the storm strengthening as it headed towards Evans Head. Shear was very strong too, pushing the cells at around 50-60 km/hr just South of East. I was a little annoyed as I could have gone straight to Evans and made it in time if I’d had my camera with me, but I had absolutely no idea there’d be any storms, so didn’t have it in the car. When I got home, a new cell was developing on the NW end of the line and looked like it would head for just N of Evans Head. I ate some lunch and shot out the door to target this cell. 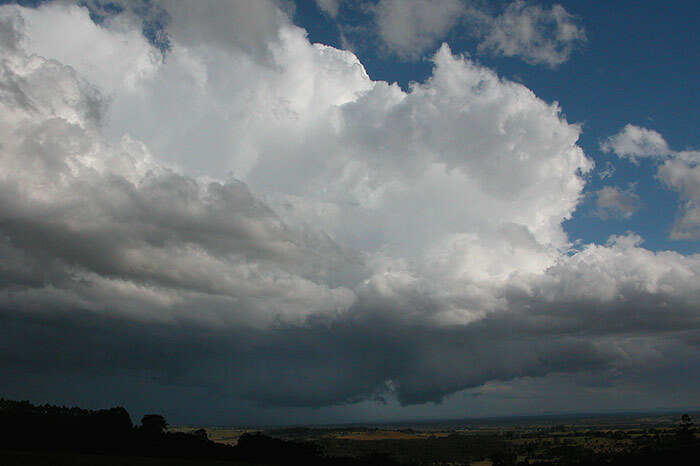 Despite the storms originally looking very low topped and high based, the cell began to put up new, higher updrafts, with the base lowering and a gustfront type feature starting to take shape. 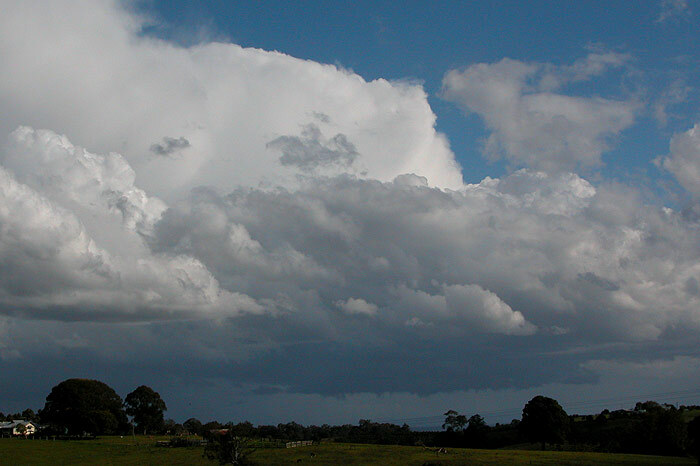 It was nice to hear thunder coming from the cell every 15 to 30 seconds too – something I really miss in winter! 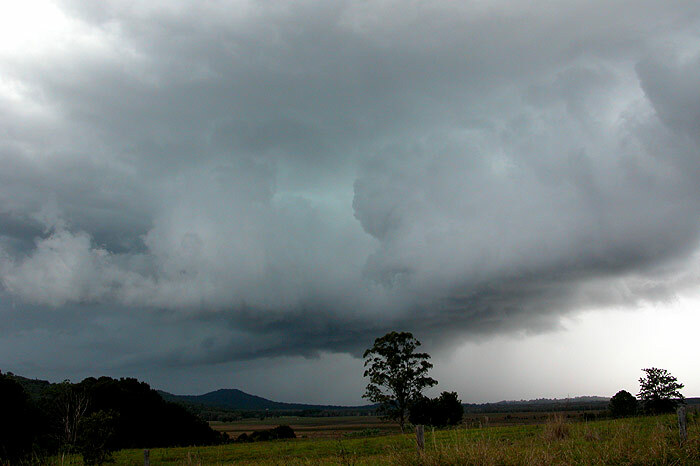 As the storm seemed to get higher topped, its base features became more interesting. 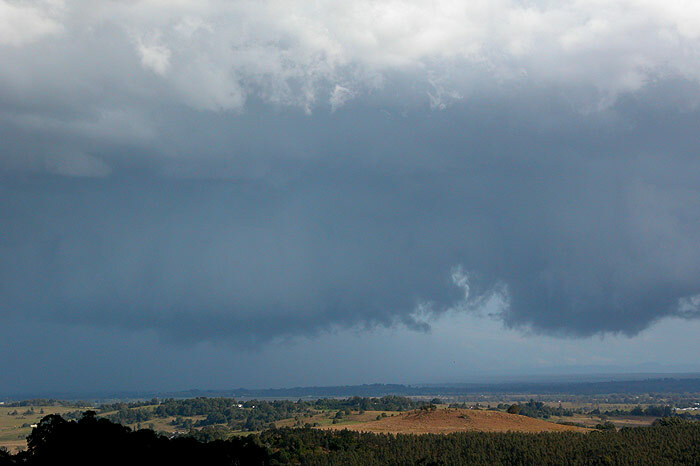 I received an SMS from Michael Bath that there was a nice cell at Evans Head and another near Coraki. My heart sank when I heard this. I thought the storm I was watching was further away, giving me time to head SE and get in front of it. But if it was at Coraki, it was going to be a push! I snapped some pics of the storm beginning to gather strength before shooting towards Coraki. As I shot down towards Coraki, it became clear very quickly that I was going to miss the storm, so I took a road that headed East. I had guessed it would take me somewhere towards Wardell, which if it did, would keep me in front of the storm. Soon the road started heading NE, and I began to get a little worried about where exactly I was going to end up. 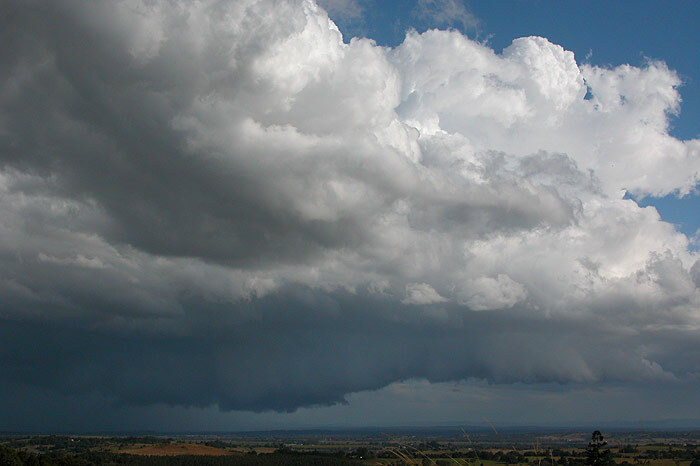 The storm was now very close by, just to my SW, and the now chunkier gustfront suggested this cell was getting stronger. 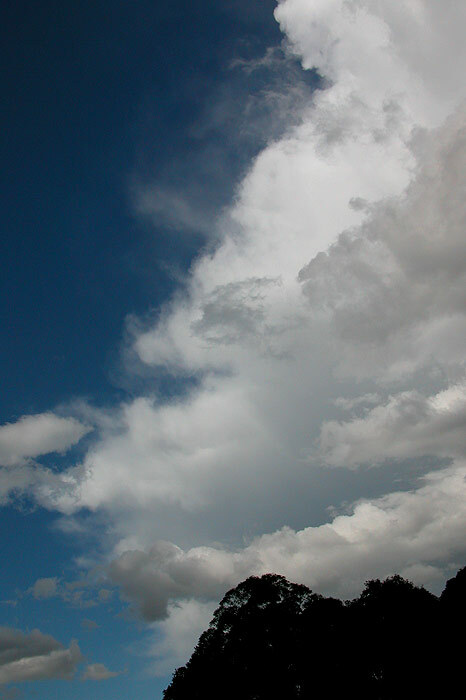 As I looked overhead, I could see the storm’s anvil had pushed much higher and was thicker looking than previously. I came to an intersection, with one road signposted as ‘Wardell’, so I quickly shot down that road, though my proximity to the storm made me think I had missed my chance to intercept it. Another clearing appeared so I stopped for another picture. 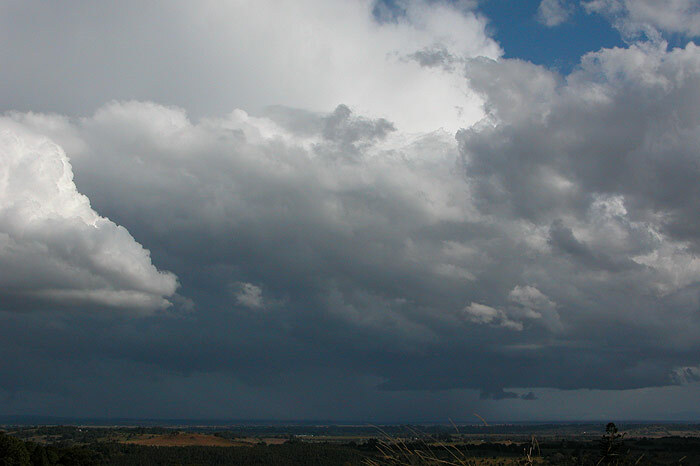 The storm was now getting a green tinge just above the more solid looking gustfront, and a hailshaft had become a little more obvious. Soon the large hill at Meerschaum Vale came into view, and I realised where I was – much further North than I wanted to be! 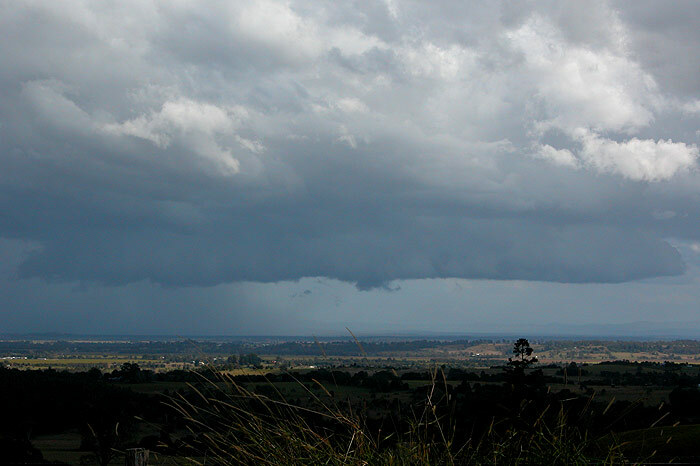 As I stopped for another photo, the hailshaft at the rear of the storm looked so much more obvious – bright white. As I progressed closer to the turnoff onto Wardell Road, I stopped a number of times for photos. The green tinge above the convective looking gustfront was pretty exciting to see at this time of year. I also grabbed a photo of the anvil which was now reasonably high. 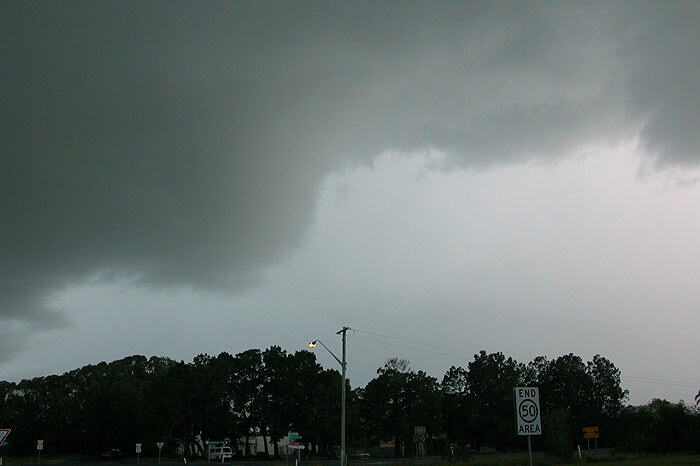 Heading down Wardell Road, heavy drops began to fall and strong outflow winds hit. 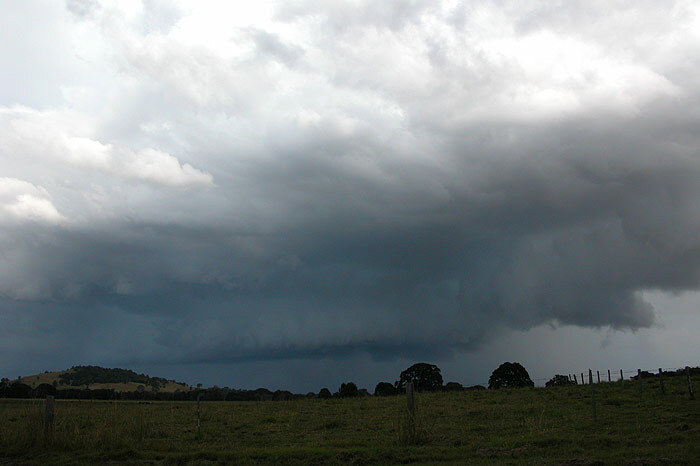 I was now under the gustfront, and could see very turbulent cloud motion on the leading edge, as warm air was lifted by the colder outflow undercutting it, causing more scuds to form quite vigorously. As I reached the Pacific Highway, I was faced with a dilemma. 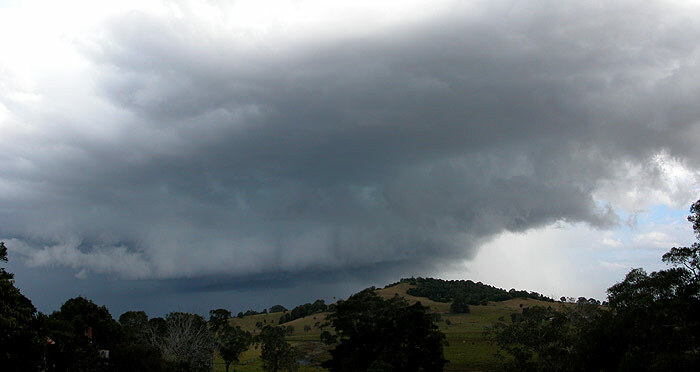 Head south in the hope to getting into the hailshaft, or head for Ballina to get ahead of the storm and get more photos of the gustfront. 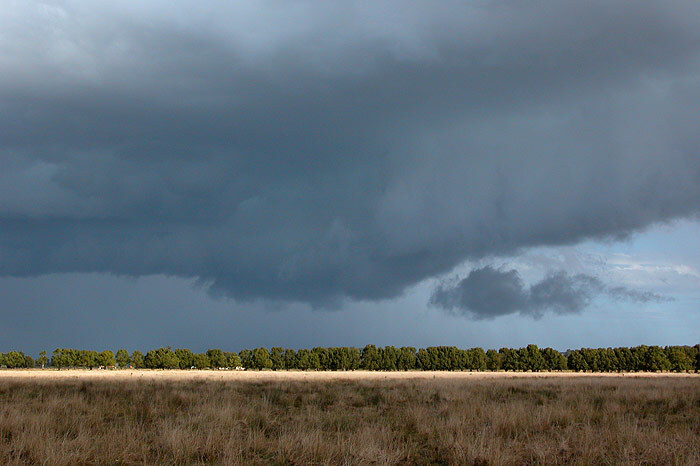 It appeared as though the storm had just about finished crossing the highway to the south, so I decided to head north rather than aim for seeing some hail. After encountering road works, hopeless slow drivers and ridiculous traffic conditions for a main highway, I finally got ahead of the storm, but it was well and truly on its way out. I stopped in Ballina on the edge of the river to photograph the remains of the guster as it passed away to my SE. Had I had this chase over, I would have headed south to intercept the hail, as there was apparently a decent amount of pea sized hail recorded in Evans Head. I also would have left my initial position near Tucki earlier! But these experiences are always great for learning a bit more about how to chase successfully. Who knows, perhaps I have learnt something from the chase that will have a crucial impact when chasing in the upcoming season!